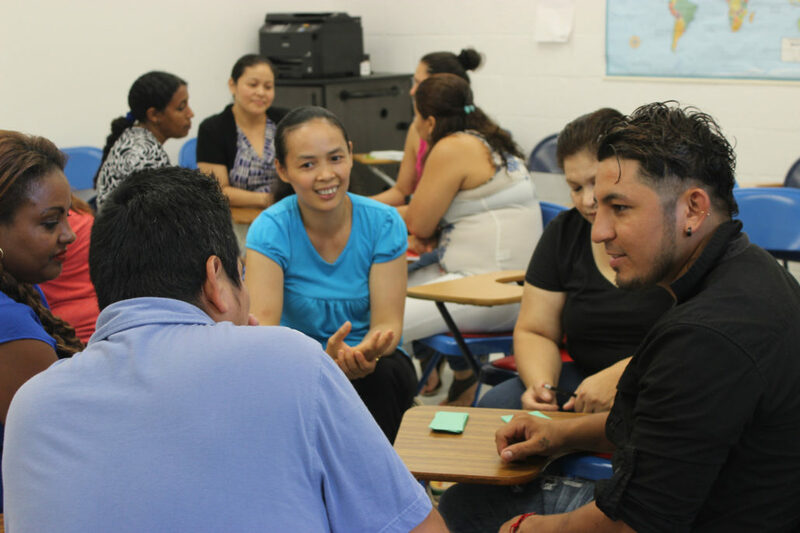 Adults in Briya’s Two-Generation Program are all English language learners, and the school strives to equip all students with the English skills they need to thrive in the United States. Briya offers six English levels, which range from Basic I, where students learn to write and pronounce the alphabet, to Advanced II, where students analyze text and learn grammar at a high-school level. English teachers take a learner-centered approach, listening to their students as they talk about their lives and struggles, then crafting lessons that will help students address these needs and get ahead in life. Instructors design hands-on activities that replicate how students will use English at home, in the community and at their workplaces. For example, in an Intermediate II class, students inquired about how to help their children get into college and pay for it. Their teacher then designed a lesson on the topic, including information about the FAFSA, college applications, and scholarship opportunities, as well as college-related vocabulary. The unit culminated in a presentation by a guest speaker, who was an immigrant working towards his degree at a university in DC. Students in Briya’s most advanced English class have the opportunity to earn a high school diploma through the National External Diploma Program, which is specifically designed to meet needs of adult learners. Students in the program use their work and life experiences to aid them in completing competencies in key subject areas. Learners work independently as well as meeting one-on-one with an assessor as needed, enabling them to balance their school, family and work responsibilities and move at a pace that best suits their needs.